FNUFNU AthleticsFNU Basketball Secures Their Seventh Win In A Row! FNU Basketball Secures Their Seventh Win In A Row! Hialeah, Fla. (Jan. 08, 2018) – The Beach Bash Classic came to an end with FNU securing their seventh win in a row against Villa Maria College by a score of 79-66. Unlike previous matchups, during the Classic Tournament, Monday Night’s game was a low scoring affair with neither team finding a groove early on. It was not until early in the second quarter where FNU reached 30 total points. 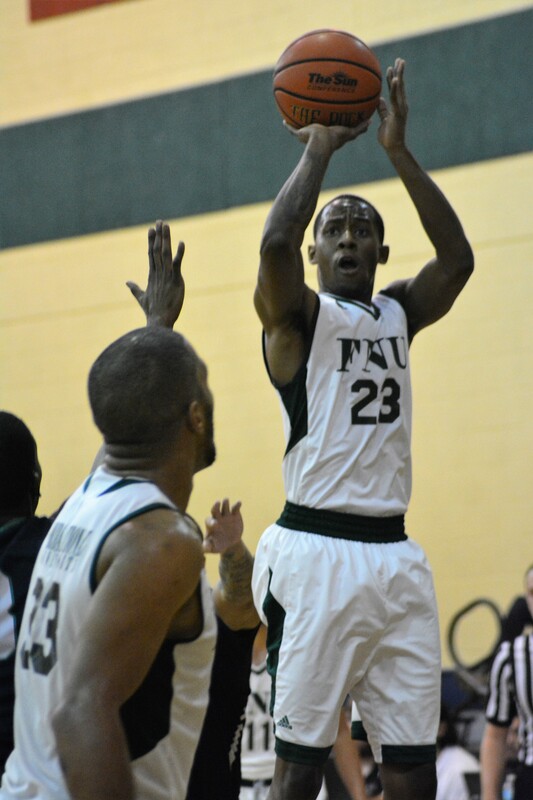 The lone FNU player who carried the offense in the first quarter was Ivenor Rosier who totaled nine points. Rosier would exit the game, however, eight minutes into the second quarter with an apparent ankle injury. Terrence Johnson (23 points) and Kenneth Santos (15 points) picked up the slack offensively during Rosier’s absence. Due to some lucky bounces and emotional flare-ups on the part of Villa Maria. FNU would finally capitalize and breakaway against Villa Maria late in the second quarter gaining a thirteen point lead that would secure their 17th win of the season. *Kenneth Santos followed up Johnson with 15 points. *Ivenor Rosier is day to day with an Ankle Injury. Location: Bucky Dent Gymnasium| Hialeah Fla.
What is next for the Conquistadores? FNU is back in action Thursday night as they play against Mid-Atlantic Christian University at Newport News, Va.